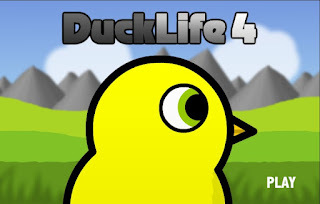 Duck Life 4 is a new animal raising simulation game from Wixgames. As the title suggests, it's about a certain kind of bird, the duck and its life. One year after the ban of genetically modified ducks, one duck racer reigns supreme and now it is up to you to beat him. Train your team of ducks and do all you can to reach the top of the duck racing sports championship. Increase skill levels of you duck by doing training in order to be fit to join tournaments which are sets of three races in a row, without breaks. You can also buy upgrades or even new ducks at the shop. Meanwhile, I look for Duck Life 4 walkthrough and have them here so you don't have to, you're welcome.